In two seasons at USC after transferring from West Los Angeles College, Johnson caught 168 passes for 2796 yards (16.6 avg.) and 16 touchdowns, including 102 for 1434 yards and 7 TDs in 1995. He received consensus first-team All-America recognition and was chosen by the New York Jets as the top overall selection in the 1996 NFL draft. Johnson showed off his potential, with 63 receptions for 844 yards and 8 TDs as a rookie, but also a distracting brashness. Big and physical, if not particularly fast, he followed up with another solid season in ’97 and, with the club improving dramatically overall, had consecutive Pro Bowl seasons in 1998 and ’99 as he caught over 80 passes and gained a thousand yards in each, scoring a combined 18 touchdowns. 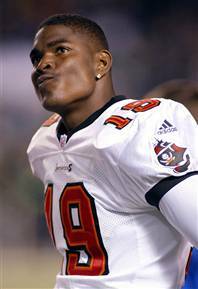 Johnson was traded to Tampa Bay in 2000 and had a lesser year, catching 71 passes for 874 yards and 8 TDs. Buccaneers went 9-7 to finish third in the NFC Central and qualified for a Wild Card playoff spot. Lost NFC Wild Card playoff to Philadelphia Eagles (31-9). Johnson followed up with 76 catches for 1088 yards (14.3 avg.) and five touchdowns in 2002 as the Buccaneers won the NFL title, but as his relationship with the coaching staff deteriorated, he was deactivated for the last seven games of the ’03 season. Dealt to the Dallas Cowboys in 2004, Johnson continued to be a productive possession receiver for two seasons and finished up by catching 70 passes for 815 yards with Carolina in 2006. For his career, Johnson had 814 pass receptions for 10,571 yards (13.0 avg.) and 64 TDs. Of those totals, 298 for 3828 yards and 17 TDs were with Tampa Bay. He was selected to three Pro Bowls.